Anyone that knows me knows that I am big on the pig, I'm a dork for pork. My mouth waters just thinking of all of the pork products I could grill from one pig. Tenderloins, sausages, pork chops, RIBS....oh MAN! 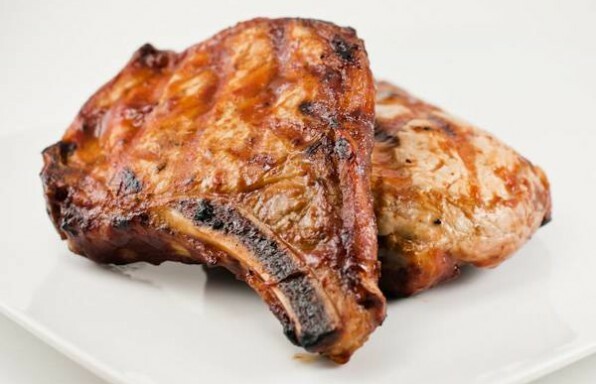 We'll cover the rest of the pig in later recipes, we're talking about grilled pork chops today. This recipe is for marinated pork chops and the marinade is one of those I tend to use on other meats like chicken as well. What I love about this marinade is that the ingredients have relatively long shelf lives, so I can keep most of it on-hand to throw together with a few hour's notice. Since it's a pretty strong marinade, it doesn't take long to penetrate the meat either, so an hour's notice is about all you need. I really like that last point, since I rarely plan on grilling pork chops or any other meat for that matter too far in advance. Enough introduction, let's get to grilling! 1Marinade. To prepare the marinade, first combine the garlic and sugar in a food processor until a paste is formed. Some chunks of garlic are fine, just pulse until you work the garlic into the sugar (or is it the other way around?). Add the soy, honey, salt and pepper and combine thoroughly with the food processor. 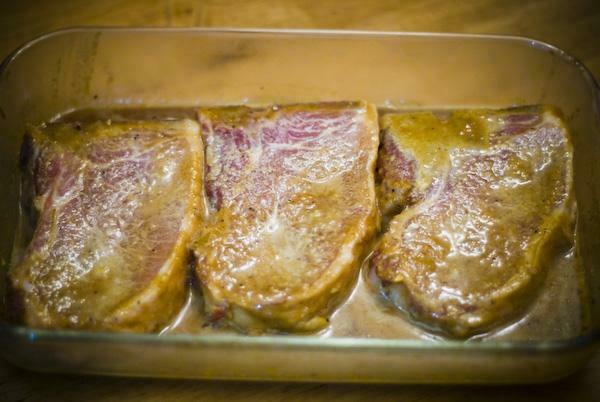 Now place the pork chops in a glass dish, pour on the marinade (scraping off any goodness on the inside of the processor), cover with plastic wrap and place in the refrigerator for at least an hour. It's a good idea to turn them over at least once while marinating. 1Step 1 - If you can swing it, try to remove the marinated pork chops from the refrigerator 20 minutes or so before grilling and just sit them on the counter. It's always best to allow the meat to warm a little out of the ice box before grilling so that the meat cooks evenly. 2Step 2 - Now preheat your grill to medium heat. 3Step 3 - Shake off as much marinade as you can and then place the pork chops on the grill. There is a lot of sugar in that marinade and sugar burns, so don't go anywhere, be vigilant from this point on! 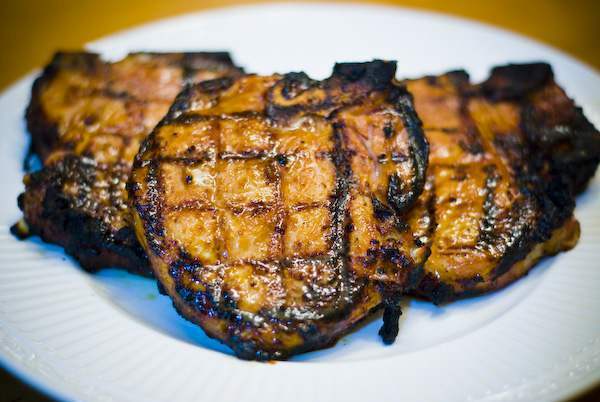 4Step 4 - After about 2 - 4 minutes, turn the pork chops to create those ever-important (to our egos at least) grill marks! 1Step 5 - After an additional 4 minutes (about 8 minutes total per side, but just keep lifting the pork chops with tongs to ensure they aren't burning), flip the chops over. 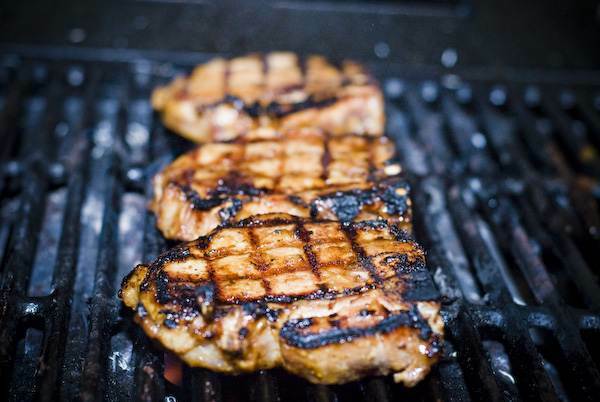 3Step 7 - Remove your grilled pork chops from the grill, wait about 5 minutes to let the juices settle and then serve! Awesome marinade! Already shared it with friends and family. I love it. These are wonderful . I have a very picky family and it’s hard to please them all with the same food. But these pork chops did the trick. I will defiantly recommend it and add it to my keepers. Awesome and easy. These were wonderful my whole family loved them. I will definitely be cooking these again. I just broiled them in the oven 6 minutes on each side and yummy.